The RYOBI 3600W 4 Stroke Petrol Generator helps you complete DIY jobs when mains power isn’t available. This powerful generator’s 224cc capacity delivers 6HP – enough to produce 3600W of electricity. That means you can operate two devices simultaneously via the two 15A outlets. For example, you might use an angle grinder while also running a pedestal fan. DIY can be sweaty work! 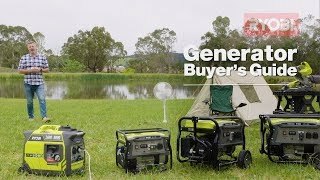 Operating the RYOBI 3600W Petrol Generator is safe and easy. The wheels and folding handle make it simple to move around, and the oil alert lamp and digital multimeter display help you keep track of your generator’s performance. Maintaining the generator is simple, too – it comes with 600mL of engine lubricant, a spark plug wrench, and a paper funnel. No matter what project you’re working on, the RYOBI 3600W Petrol Generator can deliver safe and mains-free power at your convenience. Find yours at Bunnings today.